The Keystone Passport Ultra Lite travel trailer was created to provide families with all the comforts of home, without compromising on quality. In fact, Ultra Lite boasts a range of models that cater to the wide variety of families out there. From bunkhouse models to couple’s coaches, you’ll love what is available to you. Read our Passport Ultra Lite review to learn more. The Passport Ultra Lite Express features welded aluminum framed sidewalls, gel coated filon exterior walls, and R-11 floor insulation. The interior comes with residential furniture and high grade fabric, durable residential linoleum, and two tone wood accents. If you love to cook you’ll love the kitchen’s 3 burner high output range, double door refrigerator, and a microwave. In the bathroom you’ll find a pedestal foot flush toilet and oversized 60/40 residential sink. 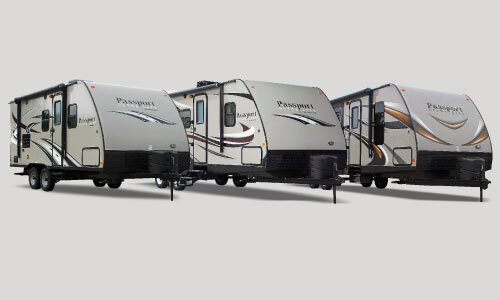 Passport Grand Touring boasts 4 scissor style stabilizing jacks, a heavy duty front mechanical jack, exterior speakers, and an electronic exterior awning. You’ll appreciate the 13.5BTU ducted A/C, king U-shaped dinette, LCD flatscreen HDTV, residential style entertainment center, and the 4 panel shaker style doors. If you’re worried about getting a great night’s rest, look no further than the queen sized bed that comes standard in the master bedroom. The Elite offers an electric slide system and fully welded outriggers. It comes with R-11 floor and ceiling insulation. It also features frameless windows, an exterior light at dump valves, and an exterior shower with hot/cold. In the kitchen you’ll find a microwave with a carousel, range hood, gas oven, a stainless steel sink and stainless steel appliances. The bedroom comes with a comfortable queen sized bed, oversized wardrobe, throw pillows, a designer bedspread, and night time reading lights. If you’re in the market for a lightweight and comfortable travel trailer, look no further than the Keystone Passport. View our Passport inventory online and contact us with any questions. Our prices are rock bottom and we don’t charge any extra fees like the big dealers.